In special cellular structure of numerous closed cells, foam glass is one of the best material to be used for low temperature heat insulation, with properties of light weight, low thermal conductivity, non-moisture absorbing, nonflammable, resistance to all chemical corrosive materials with exception of hydrogen fluoride, can be used in harsh conditions of extremely low temperature, underground, open-air, inflammatory, moist and corrosive. Foam glass is mainly made from glass, mixed with foaming agent, in a process of heating and roasting in tunnel furnace, then annealed into bulk blocks, and cut into bricks or blocks in our sandard dimension. 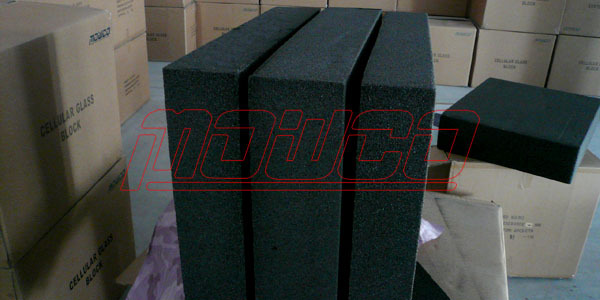 Foam glass is also an excellent material for fire and vibration proof. Typical application includes petrochemical industry, cold storage, underground engineering, ship-building and defence works as permanent heat insulation and cold preservation material. And we supply much more High Density blocks as building insulation material to the market in America and Europe.